Happy Labor Day! Yeah it's Monday and for a change it feels great knowing everyone is home and relaxing today. Again, and again I will always question who invented the two day weekend? Seriously, aren't we always reading how we need to remove the stress from our lives and find ways to relax....well hello....then at least give us three day weekends. One would think companies would be game because they would save on operation costs, no? In all seriousness...at the age of 34 he has a lot of overall pain issues actually, and he has been battling serious tooth problems for awhile now. And when he finally got insurance he found out he needed referrals for the serious stuff like root canals and bridges. His first choice of dentists never called him back, even though he left a ton of messages, so that wasted a few weeks. His second choice did and he missed his 7:50 appt, so he can't blame anyone but himself on that one. I love my man but he is a procrastinator! My new motto around here is going to be "Just Do It". Hey, it worked for Nike right? 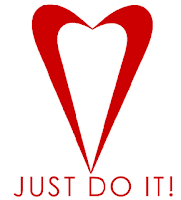 Seriously....isn't the best way to get something done to "Just Do It". Then it doesn't fester or become a thorn in ones side. I need to get him motivated, also to make and stand by commitments. The only thing in life that ever seems to motivate and commit him is sports, and that isn't bad because I love sports. But motivation and commitment in other areas would be really nice too. I wasn't always the best at this either but through a lot of hard work and determination I worked on it. But for now the new motto will have to wait until tomorrow. The plan for this Monday is to relax. Imagine that. I love holiday weekends. By the way did I mention Penn State won their first game. Next up....Alabama! Oh in searching for photos to go with the slogan I have to tell you, some interesting images popped up.